I wanted to stop by to say hello and share our new 370Z VQ37HR dyno testing and results with you! The guys at carboy in Houston did the professional install and ran the dynojet for us. The gains are quite noticeable as shown on the dyno chart bellow. HP & TQ delivery, throttle response, fuel economy, and overall daily driving is enhanced due to the great weight reduction and the small, very conservative, amount of underdriving. As you look at the charts you can see that the increase in power is shown from 0 all the way to redline (7200 rpm). Max power increased by roughly 5whp and max torque increased by roughly 6wtq. It is important to point out that the gains are even better in the mid (4000 - 5000rpm) range... gains here are roughly 10whp and 12wtq. NO OTHER $200 kit or any bolt-on mod will provide such gains!!!! All dynos were ran on the same dyno, on the same day, with NO OTHER modifications, adjustments, or changes made. These numbers are 100% legitimate and repeatable. The NST Kit includes a 10% Underdrive Crank Pulley along with a 10% Overdrive (faster) Alternator Pulley. This means that the alternator will run at OEM speeds when the NST kit is used. Extra power, torque, and response... no need to worry about a weak battery, dimming lights, or poor a/c performance at idle. Many thanks everyone, good luck and have fun with all your projects! Q. Will NST Pulleys lead to premature engine failure? In the past many engines were externally balanced. There was an external balancer attached to the outside of the engine, on the crank snout, used to balance the engine externally. The crank pulley in such engines would then be attached to this balancer. Removal of this balancer is a bad idea. These balancers were most often used on large (8 cyl) V shaped engines of the domestic muscle car era. Take a look at any modern (1980s and beyond) Honda, Toyota, Nissan, or other japanese engines and you will find no such balancer. These engines are all internally balanced, and this process has improved even further since the late 1990s. So the topic of a BALANCER does not apply here. What you will find on many modern engines is a harmonic damper. This is a small rubber band literally less than 2mm (less than 1/8th of an inch thick) that is built into the crank pulley. OEM crank pulleys are often called DAMPERS. Try placing an order for a crank pulley at your dealer and your invoice will read damper. This rubber is used to absorb something called NVH, noise/vibration/harshness. Suffice it to say, this rubber is actually not very good at performing its intended purpose after as little as a few thousand miles. What happens to rubber after a couple years of humidity, weather, snow, rain, etc? It often becomes brittle, hard, and crunchy. Can something with these properties actually absorb vibrations very well? 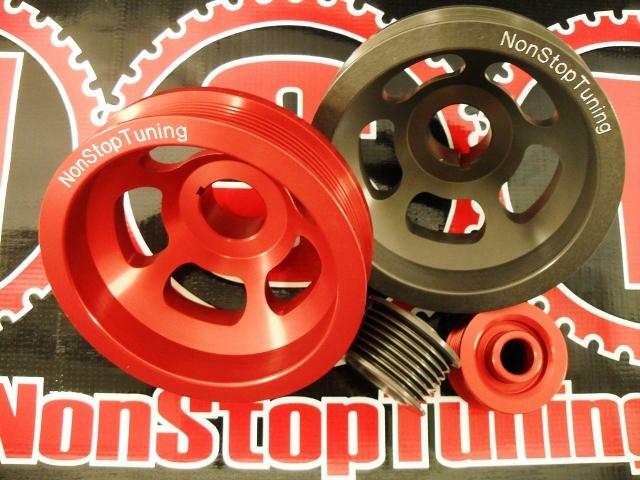 Many many NST customers, including people on your own forums, have reported smoother running engines with NST pulleys. Especially at idle. How is this possible if the rubber is such a vital and super important piece? Perhaps the rubber is not as important as it is cracked up to be?! On a relatively understressed motor with bolt-ons or low amounts of boost like what most of the people on this forum probably run, a solid pulley will not have any life threatening consequences. The factory pulley with a 2mm (less than a 1/8th inch) damper is primarily there for wide band NVH (noise vibration harshness) suppression from the engine and driveline. Removing the damper and replacing it with a solid pulley may lead to minor additional NVH but will not harm the engine. In fact, most people claim their engines seem to run smoother with NST pulleys. The engineering reasons are that most modern engines have a short, strong crank with, a relatively high natural frequency. The dangerous second harmonic that can cause damage occurs at an rpm that this sort of engine will never see, in the area above 10,000 rpm. Even the stock damper is not tuned for attenuation at this sort of rpm so the argument is somewhat of a moot point. Now weak engines that are pushing the limit with LOTS of revs, wimpy cranks, super long strokes, lots of boost and dwelling in the upper rpm ranges for long periods of time can benefit from a damper designed to deal with this sort of operation but our engine is not like this, and probably very few people with this motor on this forum push the envelope that hard. How many 500HP + 12,000RPM motors do we have on these forums? As far as I can tell, our engine has a strong and stiff bottom end that is well built for our intended use. It has an internally balanced crankshaft which is less like to break due to torsional vibration. There are a lot of Honda, Toyota, and Nissan guys who use underdrive crank pulleys in road racing series like NASA or SCCA. Road racing is much more punishing on an engine than other motorsports. The engine is subjected to run times lasting roughly 30 minutes with the engine always in the upper ranges of its rpm limit. One race weekend is the equivalent of hundreds of 1/4 mile passes. These guys would not use NST pulleys if they were not reliable. NST sponsors the first ever wheel to wheel Scion tC NASA Road Race car. The same car is also very competitive in the Grand Am and World Challenge series and has factory backing from Toyota, Scion, and TRD. This car has been using pulleys from NST with great results since day one. NST has sponsored several drift cars participating in the professional US drift series, Fromula Drift and Xtreme Drift Circuit. Several of our cars have also competed in D1 Grand Prix USA and the NOPI Drift series. (I've posted numerous photos of these cars here on this forum and on our website blog.) To make things better, NST products are also used in autocross, time attack, and drag cars. These cars have been using NST pulleys with no issues of any kind for the past few seasons. Is a solid crank pulley harmless to all engines? No it is not. As I said... small, super high reving engines, when modified way past the simple bolt on stages may have problems. These engines reach critical harmonics, past the 10,000 rpm range, an rpm only reached by few RACE engines. A mildly modded inline six will most likely be fine but one subjected to high rpm (10,000+) for long periods of time (90% of its life) with lots of boost will probably suffer. In this case , the stock balancer/damper is probably not adequate either. Some of the older american V8 engines are externaly balanced and it is critical not to use a solid hub pulley not designed for these applications, or damage to the engine could result. You will not find solid NST pulleys on our website for such engines. Our engines and most around here do not fall into the above categories. Rest assured that your engines will not blow up and die or have a reduced life in street and even racing use with these parts. I would bet that every "expert" that tells you otherwise has little personal, practical, real world experience with the subject; as it applies in your case. Thanks again everyone, good luck and have fun with all your projects! Offering the best in Pulleys, Clutches & Flywheels, Coilovers, and more. Be sure to keep up with us on the NST blog! Last edited by NonStopTuning; 10-16-2014 at 05:00 PM. Hmm...sounds too good to be true, but all the power to you. You should remember to point out the dyno is of a 350Z not a 370z, it may be a little deceiving. I'm just letting you know ahead of time before people jump at your throat for misrepresenting info. Great gains, someone needs to test these out. Its become a bit of a theme on these boards....no one will believe anything until a customer goes out and tests as an unbiased 3rd party. gotta agree with RCZ on this one. I think someone should really try these out. Thank you for the interest and the replies guys. The gains are definitely there and they are very noticeable. The dyno testing was done with a 350Z HR, which I have been very clear about in the pics and info that I posted. The 370Z uses the same pulleys and is a bigger, more efficient, engine. 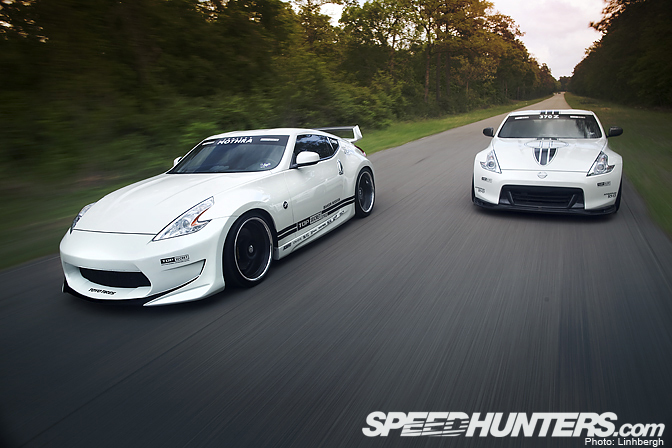 The gains with the 370Z should be very similar, if not better. We do not fabricate results, we don't need to. Feel free to search the forums I listed and look through the reviews that our customers have posted regarding our products, performance, and service. Thanks again, good luck and have fun with all your projects everyone! We try very hard to provide the BEST kits for both street and track use. Offering the best of both worlds, and doing so at VERY affordable prices. Good luck and have fun with all your projects! Last edited by NonStopTuning; 08-26-2009 at 09:47 PM. I also have to say that I bet the 370Z is more efficient and won't share these same gains as the 350Z. Would be a lot more interested if someone would try these pulleys on a 370Z. The more HP and TQ an engine makes, the more lightweight underdrive pulleys can free up. someones already dynoed the stillen one at 5whp through the powerband on a 370, its on the site somewhere.. this seems right on par with those numbers. Sorry, I didnt try to say you were fabricating results.. if I werent getting a supercharger I would give it a shot. 5 whp and 6 wtq sounds about right. Nice job. Does the crank pulley come with a steel collar? Just like you didn't own the GTR.. Kids with internet pipe dreams, ftmfl..